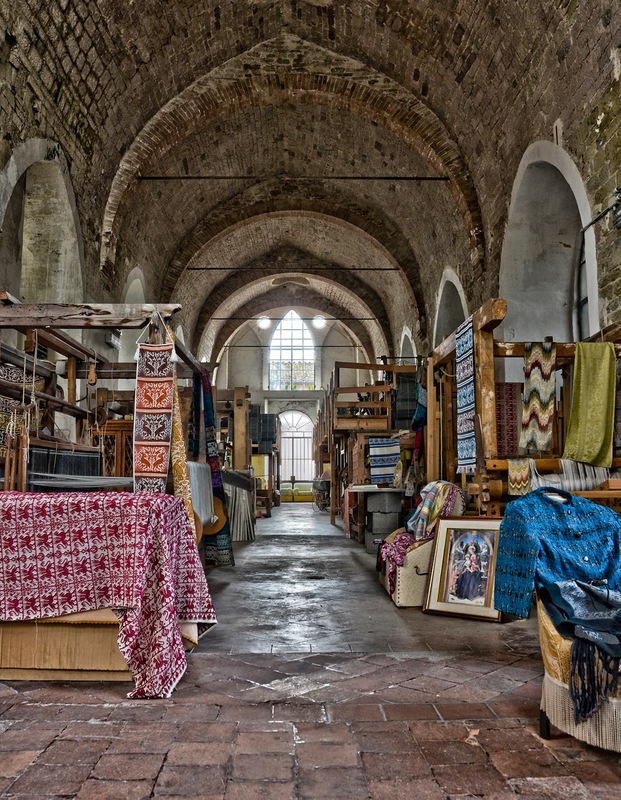 Wouldn't you love this to be your weaving studio? Marta is the fourth generation of women from her family to be working in the Laboritorio di tessitura but she is the first weaver. Her Great grandmother, grandmother and mother were managers of the business. Marta taught herself to weave after her mother had closed the laboritorio. She has trouble counting and remembering sequences of numbers so instead designs and weaves by imagining pictures or picturing the pattern of what she wants to create. In the laboritorio are one or two treddle looms and seven jacquard looms, each a different size and size of reed threaded with warps starting at 100 metres. Patterning is created by card chains, one card, with about six rows of holes, is one row of pattern. Marta has no time to make new patterns as it is so time consuming making the cards. Luckily there is a good store of existing pattern chains to use built up over the years. The jacquard looms with every thread separately controlled and weighted have one foot pedal and double fly shuttle. The big looms, especially the 1.9metre wide one, are so heavy to lift it gave Marta a hernia a couple of years ago so she now employs a man to operate the biggest loom. Marta's favourite patterns are the old medieval replicas. 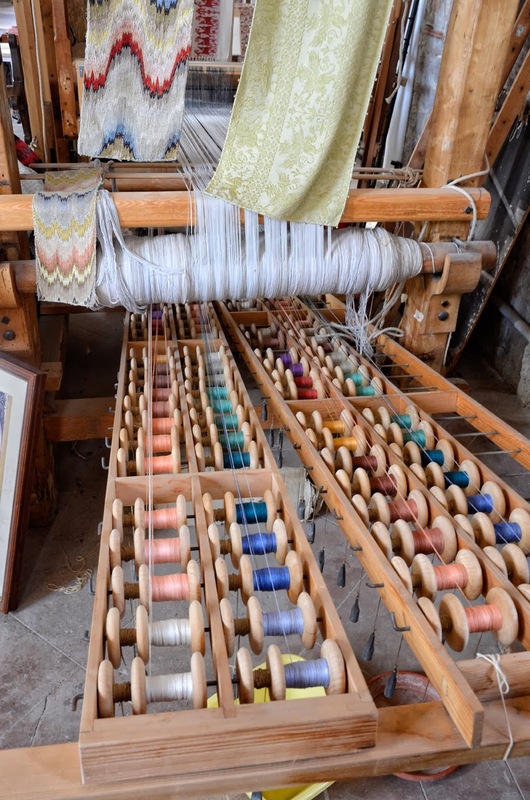 She enjoys studying the paintings of the old masters from her area of Umbria and replicating the fabrics she sees in them and loves working on the really old looms. 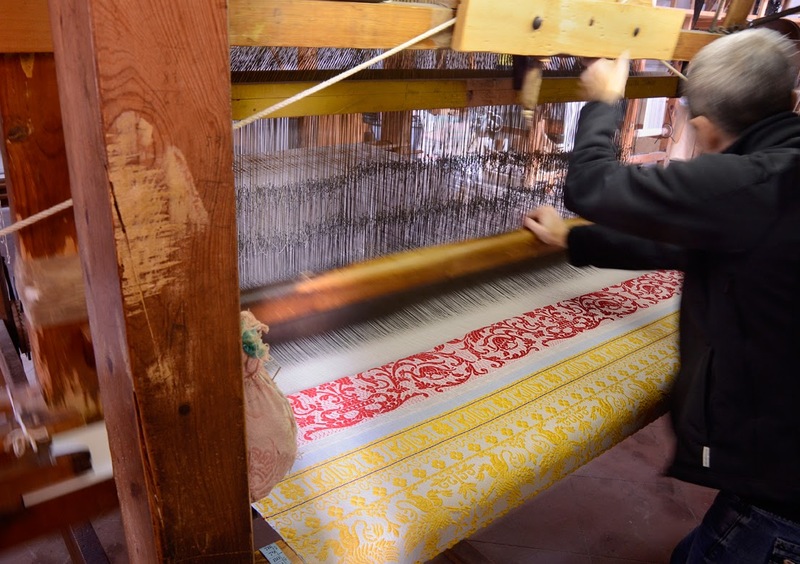 Some years ago Marta acquired a loom to do Florentine weaving after the last operator had died. She spent many years replacing broken parts of the loom and figuring out how it works. Its a very slow technique at about 18cm per day. Marta says she has an expensive hobby as any profit goes into restoring the magnificent old church in which she works each day. That. Second. Picture... Gulp....... !!!!! I swear the environment has a lot to do with the finished product, at least in my case. So if I could weave in a tidy beautiful room, I could do so much better. Or that's the story I'm sticking to. Love your travelogue. Glad you enjoyed the travelogue Meg. It wouldn't matter where I was I'd still be untidy and you know, when I sit at the loom I don't see the mess. It'd be nice if life was like a TV show with lots of "little elves" in the background preparing and tidying up!